It’s a popular choice for many – the split system air conditioner. Brisbane homeowners on a budget and who are only looking to cool a smaller area often opt for this versatile system. Split system air conditioners are mostly easy to install, have minimal costs and are efficient to run. Split system reverse cycle units also offer both cooling and heating functions, perfect for the varying temperatures we experience here in Brisbane. The compressor unit of a split-system, usually smaller than a ducted system, is located in an area outside away from direct sunlight and where it is not a noise risk to neighbours. The indoor wall units have evolved over the years and come in many modern and stylish designs to suit your interior décor. If there is ever a need to add additional wall units, split-system air conditioners are usually able to accommodate up to 6 wall units per compressor. If you’ve been searching for keywords online such as ‘Split System Air Conditioners Brisbane‘ or ‘Split System Air Conditioner Brisbane‘ and you’re not sure who to choose, talk to the amazing team at H&H Air Conditioning today on (07) 3276 1800 and we’d be delighted to help. Inverter systems are increasingly popular because of their energy efficiencies. In comparing an inverted system to a conventional system, an inverter has the ability to vary the compressor speed while maintaining the set temperature. However, a conventional system either operates at full speed or it is off, there is no in-between. This has an obvious impact on energy efficiency and the costs associated. There are cooling only systems on offer if you think you can bear the cold of winter. These systems do not have a heating function like a reverse-cycle system does. It’s great if you’ve got a tight budget but perhaps frustrating when your teeth are chattering and you really wish you had the heating function. If you’re budget conscious and you don’t want to take the risk of getting through a winter without heating, consider looking at reverse cycle air conditioning units. Brisbane and Sunshine Coast weather is usually quite comfortable all year round but if you want to avoid the pain of hindsight, opt for a reverse cycle. The good news is that reverse-cycle air conditioners have the benefit of heating and cooling in one. They are also much more energy efficient than traditional heaters, which means they help the environment and save you money. Some brands offer various styles of indoor units depending on the look you are going for. Wall mounted – the most common split system air conditioner where the indoor unit is mounted on the wall. Cassette – a discreet option whereby the unit is installed in the ceiling with only the grille showing. Multi-systems – a multi-system allows for one outdoor unit to be connected to 2, 3 or 4 indoor units. The indoor units can be wall mounted, floor/ceiling or cassette units. H&H Air Conditioning Brisbane has specialist sales engineers that will visit your home to determine the size of the system you require. When they carry out the assessment, they will take into account factors such as room size, windows, doors and room layout. When purchasing a split system air conditioner for your home it is essential you get the correct advice. Different size rooms and different areas of homes require different size units and will have specific installation requirements, all of which need to be considered. When searching for the best dealer in split system air conditioners, Brisbane is overflowing with buying options. But are all these people authorised to sell these systems? 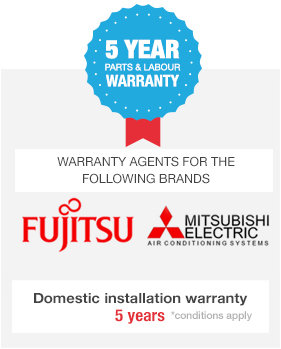 There are a number of reasons you should only buy your air conditioner from an authorised dealer. To locate an authorised dealer, visit Look for the Tick, a website run by the Australian Refrigeration Council, an independent body appointed by the Minister for Environment and Heritage. Although Brisbane split-system air conditioners are relatively easy to install, you’ll soon lose the money you thought you were going to save by using an inexperienced and unqualified installer. Perform a quick license check at the Australian Refrigeration Council to avoid system inefficiencies, huge electricity bills, environmental impact and discomfort due to an incorrectly installed system. H&H Air Conditioning offers a variety of split system units to suit a wide variety of needs. Here we’ve included a summary of each to familiarise you on your buying journey. If you’ve decided on a split system air conditioner Brisbane solution, H&H Air Conditioning would love to help you with the next step. Contact us today and we’ll answer any questions you might have or call us on (07) 3276 1800, so you get the best possible solution.